Happy Sunday y'all! I'm deciding to mix this one up a little bit since it's a typical lazy Sunday. Since these two kids are teammates why not do joint-analysis?! Ok, you win...I'll do it. Let's just dig right into what you all really want to know...why are these kids under the radar? Looking at their rankings, we see Watson being rated as high as a 3-star, but NR on two sites. Canteen is the more known prospect, receiving an impressive 4-star from Rivals, who has the most up to date rankings. He still get's 3-star status on Scout and 247Sports, and ESPN has nothing. Size wise? As I mentioned above, Canteen is a perfect fit for the slot at 6'0 170. Rivals tends to disagree, listing him at 6'3" (!!) which if true, this is an even bigger steal and my excitement level just skyrocketed through the roof. Watson is a big, long DB standing 6'1 (ESPN & 247Sports say 5'11") weighing 185 or so; Scout goes as high as 190. 2) CB Brandon Watson – Elkton (Md.) Eastern Christian While most knew about Watson heading into the weekend, nobody expected the show that he put on. The 6-foot-0, 187-pounds cornerback rarely got beat and won the matchup against Godwin in the semi-finals. He displayed terrific ball skills, great speed and excellent footwork. Watson holds offers from Boston College, Connecticut, Temple and Rutgers with heavy interest coming from Syracuse and Maryland. Sills and Canteen connected often during this weekend. The 6-foot-0, 175-pound receiver was very difficult to defend and his routes were some of the best out of the entire camp. Canteen did plenty of talking on both days, but he backed it up every time. He currently holds offers from Maryland, Hawaii, Rutgers, Temple and others, but Canteen doesn’t claim a leader at this time. And he's not kidding. Ali will be a top prospect in the '15 class. Being a nightmare on the field for a top prospect: priceless. Michigan now (technically) has 3-4 spots left. But have no doubt, this class will go beyond that limit and expect 6-7 more to join; Way to much talent still left with significant interest (Hand, McDowell, Williams). I'd say this closes the door on WR for the class, especially with Artavis Scott dropping Michigan from consideration after they accepted Canteen's commitment. Best of luck where ever he ends up. 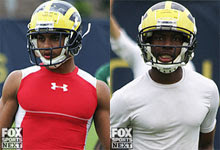 I'd say Hoke and co are done with the CB position, but still wants a safety in the class. It'll come down to a 3-headed battle between Parrker Westphal, Juju Smith, and Monte Nicholson. Both had similar offers: UConn, Rutgers, and Temple. Watson also held a Boston College offer. Canteen's list was a bit more impressive with Tennesse, Maryland, and Hawaii also in the mix, with USC and West Virginia showing interest. Michigan now has their slot receiver to weave in and out between the skyscrapers that Michigan has recruited to play on the outside, making him the 2014 version of the 2010 Roy Roundtree. Seeing action as a freshman is a good possibility. At CB, Watson will play opposite Jabril Peppers, providing Michigan with the most physical defensive backfield in the county with Dymonte Thomas holding down the safety position. Them providing a blanket over opposing receivers won't even compare to the physicality they will bring to stopping the run game.